Populicious and del.icio.us/popular are two wonderful RSS feeds that show you what is popular on the web each day (I like Populicious better because it removes duplicates). But the problem with these feeds is that they only give a title for each link -- there are no descriptions. To find out what each link is about, you have to guess from the title, and failing that, actually visit each link. This is time consuming -- and totally unnecessary because many del.icio.us users enter descriptions for their links. Descriptious to the rescue. Descriptious augments each of these wonderful feeds with descriptions entered by del.icio.us users. So now when you're checking out those new links, you get descriptions for each of them. Simply subscribe to the Descriptious version of the feed (see the links at the end of this post). What other feeds would benefit from del.icio.us descriptions? Below is a picture of Descriptious in action. Note the descriptions in italics, collected from extended descriptions entered by del.icio.us users. They are useful for getting an idea of what the article is about, as the headlines are often not very helpful. Bloglines tip for eliminating duplicates: If you are using Bloglines, you might encounter duplicate entries in your Descriptious feeds, probably because Bloglines is treating textual changes as updates. And of course the text changes as people add descriptions. The solution is to go into Bloglines, click Edit Subscription, then set Updated Items to "Ignore". posted by Jonathan at 5/05/2005 08:25:00 p.m.
That is very nice indeed. Why don't you do the same for Trendalicious? By Robin Good, at 5/06/2005 3:55 a.m.
By Quick Online Tips, at 5/06/2005 4:34 a.m.
Robin - Alright, I will add one for Trendalicious when I get home tonight. I'll let you know when it's done. 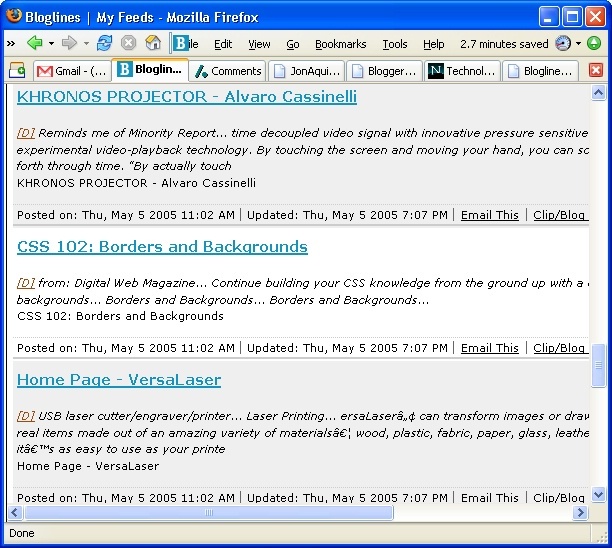 By Jonathan, at 5/06/2005 1:30 p.m.
And thanks to Gina Trapani at Lifehacker for the idea about providing HTML versions. Done. By Jonathan, at 5/07/2005 12:18 a.m. Thanks for the link, nice work. By Wes, at 5/07/2005 3:50 p.m.
Wes - You're welcome! Enjoy! By Jonathan, at 5/07/2005 5:45 p.m. It's cool when someone puts an image URL in their description. Example: http://del.icio.us/url/83983b874e1280edfc0948ad602055ae. The image shows up in the Descriptious feed. Could widespread adoption of Descriptious be an added incentive for people to enter good extended descriptions in del.icio.us? By Jonathan, at 5/08/2005 9:24 p.m. This is very nice and the HTML version is now on my bookmarks toolbar. I requested something similar, but instead of a long description, just the first 3 or 4 most popular tags would be more useful. I can then just visually scan the tags and quickly see what links are likely to interest me. By Iain, at 5/10/2005 3:34 a.m.
Hi Iain - I'm delighted that you find it useful. Excellent idea about adding the top 3-4 tags. I will look into it! By Jonathan, at 5/10/2005 7:53 a.m.
Help! When I click the RSS link, or even when I make a bookmark of the link, it goes to this result: "This XML file does not appear to have any style information associated with it. The document tree is shown below." Firefox is not showing an orange RSS button to click. By Matt Arnold, at 5/10/2005 7:59 a.m.
By Jonathan, at 5/10/2005 8:06 a.m. Thanks Jon. I hope it's not difficult. By Iain, at 5/10/2005 8:35 a.m.
Great! Thank you very much, Jonathan. By Matt Arnold, at 5/10/2005 8:52 a.m. I have implemented Iain Cheyne's brilliant idea of including the top 3-4 tags at the start of each description. By Jonathan, at 5/10/2005 7:53 p.m. I wish the page design was a bit cleaner, but otherwise it's absolutely perfect. By Iain, at 5/11/2005 1:57 a.m.
Hello, the Descriptious version of Populicious is really cool and usefull, I like the Cheyne's layout. Just please could the last line of each entry be deleted? It is the same as the Title, so what's the point? It just eats up space. Thank you very much. By Anonymous, at 5/27/2005 1:31 a.m.
By Jonathan, at 5/29/2005 8:04 p.m.
By Chris Clark, at 6/02/2005 8:03 p.m.
By Jonathan, at 6/02/2005 10:17 p.m.
You are making some great web tools, thanks for all of the work you have put in for our benefit! By Dewayne Mikkelson, at 6/13/2005 6:21 a.m.
Dewayne - My pleasure, seriously. It's great that I can make these tools for myself; it's doubly great that everyone else can use them too, through the magic of the web. By Jonathan, at 6/14/2005 12:08 a.m.
Wow, you really have some useful apps rolling! Oishii (http://opencontent.org/oishii/) would also benefit. By saurierduval, at 7/12/2005 2:23 p.m.
Keep up the good work, Jonathan! I've found a few of your projects on del.icio.us, and it's fun stuff. I'm not a coder, so I'm not sure how I'd go about rolling my own version of this. Any ideas? By Scott Crawford, at 7/15/2005 2:00 p.m.
Hi saurierduval - Alright, I've added a descriptious feed for oishii!! 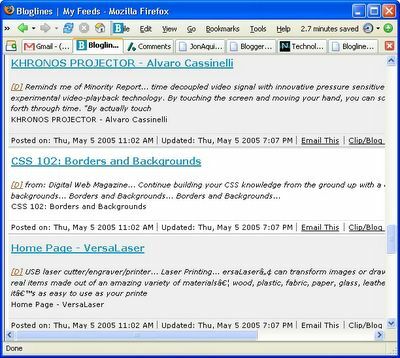 By Jonathan, at 7/19/2005 10:51 p.m.
Descriptious is one of my favorite feeds. It's one of the very few I try to keep up with consistantly. I've thought of a couple of features that might be nice to include. I realize that these might be difficult, if not impossible to implement, but it doesn't hurt to ask, right? First, since my foreign language skills are pretty limited, it would be nice to somehow be able to filter out non-English pages. As a shortcut, is it possible to scan the data in a page for the most common English words, such as "the", "of", "to", "and", & "a." Also, I wonder how hard it would be using del.icio.us's API to have a personalized feed that gives an indication of the similarity of the tags for a given link to my own collection of tags. For instance, if the most popular tag for a given page were GTD and my bookmarks in del.icio.us contained lots of GTD links, the score would be higher. I realize that might be difficult to implement and may go against the idea of syndication, but it's a feature I'd love to see. In general, I'm fighting the information overload battle and looking for any shortcuts to help keep up on all the great stuff out there. In any case, thanks for the great tool. By Matt Vance, at 9/08/2005 7:43 a.m.
Hi Matt - Thanks for the ideas. And have you checked out digg.com? It's an interesting alternative to delicious/popular. Ha! More information to overload you with. By Jonathan, at 9/08/2005 9:12 p.m.